Get ready for the most epic spring break experience ever with this Microgaming video slot machine. The slot takes players on a wild ride as they accompany a group of teens as they enjoy Spring Break. Players will see everything they can expect to see during a spring break trip. This includes ice cream, burgers, fries, beers and drinks, pizza, pool parties, a jeep car, beach parties, tacos and dip. All of these things appear in the form of symbols that land on the reels of the game and the 9 lines that the game offers. All of these symbols come in amazing visuals that succeed in providing players with a great gaming experience. 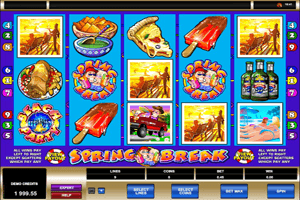 Play Spring Break Slot here. Although the game only has 9 lines, which might make a lot of players think that the game is not that rewarding, the slot in fact has some of the highest payouts online. Players can check out all of these different payouts by opening the paytable of the game by clicking on view pays. They will check out the different line rewards alongside the different bonus symbols that the game has in store for them. There is the Beach Party symbol which is the scatter bonus symbol of the game. It will trigger the free spins round for lucky players when a minimum of three symbols land anywhere. The Spring Break logo symbol is wild and it will also double any payouts that it participates in creating.